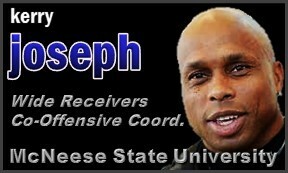 One of the greatest, if not the best, quarterbacks to don the blue and gold, Kerry Joseph, returned to McNeese to serve as co-offensive coordinator and coach the wide receivers in 2016. In 2018, his positional responsibilities shifted from wide receivers to quarterbacks in 2018, maintaining co-offensive coordinator duties as well. His coaching experience includes a pair of NFL Training Camp internships as well, one with the Saints (2014), and the other with the Buccaneers (2017). Kerry was named Interim Head Coach in November 2018, following the termination of head coach, Lance Guidry following a 6-5 campaign. Joseph, McNeese’s all-time career leader in touchdown passes and second in career passing yards and total offense, spent last season as a training camp intern with the New Orleans Saints working on the offensive side of the ball under head coach Sean Payton after he officially retired from a 12-year career in the Canadian Football League. Over the past few years, the New Iberia native spent many of his off-seasons as a player working in strength and conditioning and helping youth football. He broke into the CFL in 2003 with Ottawa and then moved to Saskatchewan in the 2006 dispersal draft after the Renegades folded. He helped the Roughriders win the third Grey Cup in franchise history in 2007, the same year he was named the league’s Most Outstanding Player. He also played for Toronto, Edmonton and Saskatchewan before retiring for football in December 2014. Joseph won 41 games and three Southland Conference championships as a starter for the Cowboys from 1992-95 including leading the program to its first-ever playoff victory (1992) and first national semifinal appearance (1995). He was named the SLC and Louisiana Player of the Year in 1995 after leading the Cowboys to a 13-1 record and No. 1 ranking for most of the season. In 1992, he was selected as the Southland and Louisiana Rookie of the Year. He earned first team all-SLC and all-Louisiana honors in 1995 and earned second team all-conference honors as a junior in 1994. Joseph originally signed with the Cincinnati Bengals as an undrafted free agent in 1996 where he spent most of the season as the third string quarterback. He played quarterback for the NFL Europe’s London Monarchs in 1997 and later signed with the Washington Redskins later that year as a tailback. In the spring of 1998, he played for the Rhien Fire of the NFL Europe as a safety and helped lead his team to the World Bowl Championship. He continued as career that led him to being one of just three players in league history to exceed 4,000 yards passing (4,466) and 1,000 rushing (1,006) in a season when he achieved the feat in 2005. In 2007 he rushed for 13 touchdowns, the second most by a QB in a single season in CFL history. That same year he led the Saskatchewan Roughriders to a Grey Cup Championship and became the first Roughrider to win the CFL’s Most Outstanding Player Award since the 1976 season. Joseph was inducted into the McNeese Sports Hall of Fame in 2006 and the Southland Hall of Honor in 2012.